I wrote this post on Sunday night, the night before my race. I thought that I had posted it but it apparently didn’t work. So here it is, a few days delayed. It’s Race Eve, and I’m sitting in my hotel room getting everything together for tomorrow. It’s been quite an awesome weekend so far, and I am so excited for the culminating event tomorrow morning. dare2tri Elite Team ready to race! 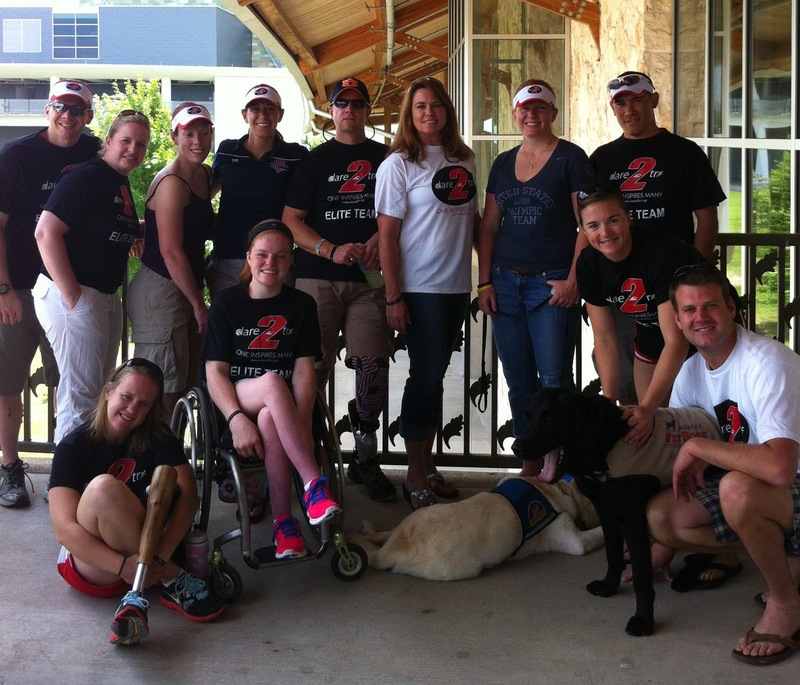 The dare2tri Chicago crew flew to Austin on Friday morning. After the most entertaining plane ride ever (thanks to our flight attendant, Will) the team headed to the hotel to get settled. A few of us went for a short run, but with the insane heat and humidity, we didn’t make it far before I tasted like a salt tablet. It was after that run that I really realized the importance of hydration. Since then, I’ve been consuming more water, Nuun, and tomato juice than any normal person should, averaging about 12 trips to the bathroom per day. Now that we’re a few days into the trip, I’m glad we got here early to give us some time to acclimate to the heat. On Saturday morning, the team ran from the hotel to a spring where the Challenged Athletes Foundation was hosting a swim clinic. I was able to get in my wetsuit and practice swimming in open water. We spent the rest of the day exploring downtown Austin, walking through the transition area, and going to athlete meetings. This morning, I rode part of the bike course. I was a little nervous about the bike coming into the ride, as I had heard scary things about some of the hills and turns. But I felt really comfortable riding it today, and feel much better about it going into tomorrow. There will be over sixty paratriathletes competing in the national championship wave, up from just thirty-seven last year. Every athlete falls into one of six classifications. My classification, TRI-2, is made up of female above-knee amputees. This week, there are three TRI-2s competing—myself, Melissa and another woman from Texas who I met at a training camp last summer. At this point, I can honestly say that I have never felt more calm before a race. Usually on the night before a race my stomach starts to hurt as I go over all the things I may have forgotten to pack in my transition bag. But tonight, I know that I have done everything I could to prepare myself, and I am feeling stronger than ever. I know the course well, and am confident that there is nothing on it that I can’t handle. No matter how the race goes tomorrow, this entire weekend has been such an incredible experience. I have been able to spend quality time with my team and see friends that I’ve met at clinics in the past. I’ve also been able to meet people whose names I’ve only heard—people who have already made their mark in Paratriathlon and disabled sports, and who have paved the way for me to be here this week. Just walking through the hotel lobby is an experience; seeing so many athletes with ripped bodies and gorgeous bikes makes me so excited to be here. I feel so fortunate to be able to walk amongst them, and am humbled to be racing alongside them tomorrow.